Deputy Attorney General Rod Rosenstein came to the White House on Monday and met with chief of staff John Kelly with the expectation that he would be fired, but remains in the post, sources tell ABC News. “At the request of Deputy Attorney General Rod Rosenstein, he and President Trump had an extended conversation to discuss the recent news stories. Because the President is at the United Nations General Assembly and has a full schedule with leaders from around the world, they will meet on Thursday when the President returns to Washington, D.C,” White House press secretary Sarah Sanders said in a statement. After shaking hands with Kelly within view of news cameras as he left the White House, Rosenstein was back on the job at the Justice Department Monday afternoon. In New York, Trump spoke about his call with Rosenstein but, questioned by reporters, did not signal whether he intends to fire him. During his first formal bilateral meeting on the sidelines of the United Nations General Assembly meeting – with the President of South Korea – Trump indicated he would make no decision on that before Thursday. The president has already spoken to another official about becoming the acting deputy attorney general, sources told ABC News. The news came on the heels of reporting that at a May 2017 meeting between Rosenstein and then-acting FBI Director Andrew McCabe, Rosenstein suggested that McCabe or others wear a wire when speaking with the president, according to memos McCabe made of the conversation, sources familiar with them told ABC News. The meeting took place a week after President Donald Trump had fired James Comey as director, the sources said. Additionally, sources told ABC News that, according to the memos, Rosenstein told McCabe he could recruit members of the president’s Cabinet to invoke the 25th Amendment to remove Trump from office for being unfit. Rosenstein believed he would be able to persuade Attorney General Jeff Sessions and then-Homeland Security Secretary John Kelly to sign on, according to the sources. After Comey's firing, ABC News previously reported that Rosenstein was so upset with the White House for pinning Comey’s dismissal on him that he was on the verge of resigning. 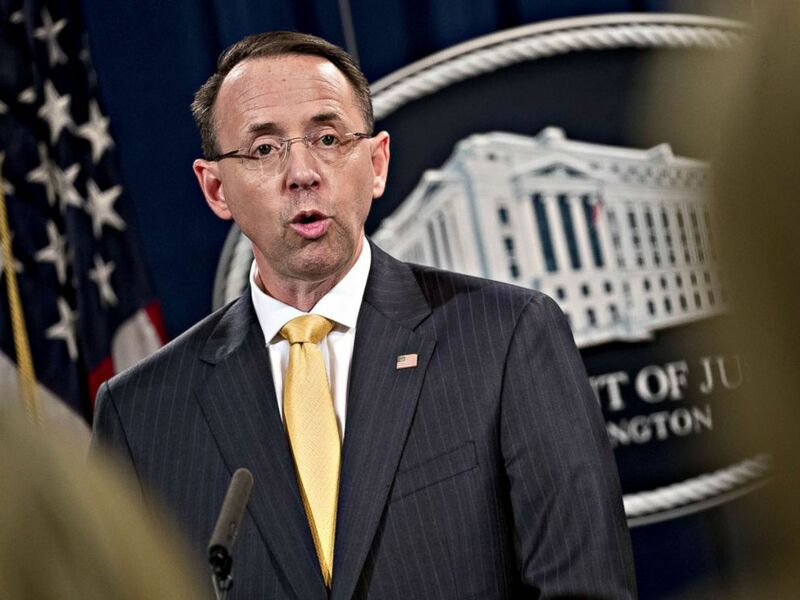 Rosenstein remained on the job and a week later assigned Robert Mueller as special counsel to look into allegations that the Russian government tried to influence the 2016 presidential election. Attorney General Jeff Sessions recused himself from the Russia probe early last year. The White House, as of Friday evening, had not commented specifically on the story about the May meeting. The Office of Special Counsel declined to comment on questions about Rosenstein's potential departure. McCabe on Monday expressed concerns about the news and its possible implications for the Russia probe. "There is nothing more important to the integrity of law enforcement and the rule of law than protecting the investigation of Special Counsel Mueller. I sacrificed personally and professionally to help put the investigation on a proper course and subsequently made every effort to protect it," McCabe said in a statement. "To be clear, I had no role in providing information of any kind to the media stories about events following Director Comey's firing. If the rumors of Deputy AG's Rosenstein's departure are true, I am deeply concerned that it puts that investigation at risk." Trump, speaking at a rally in Springfield, Missouri, once again attacked his Justice Department. "Look what's being exposed at the Department of Justice and the FBI," the president told a packed house Friday night. "You have some real bad ones. You see what's happening at the FBI – they’re all gone, they’re all gone. But there’s a lingering stench and we’re going to get rid of that too." “I never pursued or authorized recording the President and any suggestion that I have ever advocated for the removal of the President is absolutely false," Rosenstein said. Trump has repeatedly called the Russia investigation a "Witch Hunt" and asserted he has done nothing wrong. He does not, however, have direct authority to fire Mueller — that authority belonged to Rosenstein and now could belong to Noel Francisco, the solicitor general. Rosenstein was confirmed as the second highest ranking official in the Justice Department, with wide bipartisan support, just over a year ago. But Rosenstein’s name was in the headlines since just weeks after he began his new role at the Department of Justice after reports that he signed off on an FBI raid of the home and offices of Trump’s longtime former personal attorney Michael Cohen. The raid, which was connected to the special counsel’s investigation, was approved by Rosenstein, who has overseen the investigation since Sessions recused himself. The president later tweeted that Rosenstein was “conflicted” in his role supervising the investigation. Rod Rosenstein, deputy attorney general, speaks during a news conference at the Department of Justice in Washington, March 23, 2018. In Congress, part of the comfort with Rosenstein stemmed from his resume. He served both Presidents George W. Bush and Barack Obama as the politically-appointed U.S. Attorney in Baltimore before coming to headquarters. Rosenstein also appeared to have the backing of intelligence community veterans. In July, he received a standing ovation at the Aspen Security Forum, a gathering of past and current senior officials in U.S. intelligence and law enforcement circles. Speaking there, he took pains to avoid commenting on the Mueller probe. But he did make clear he believes Russia was trying and continues to try to undermine U.S. elections. 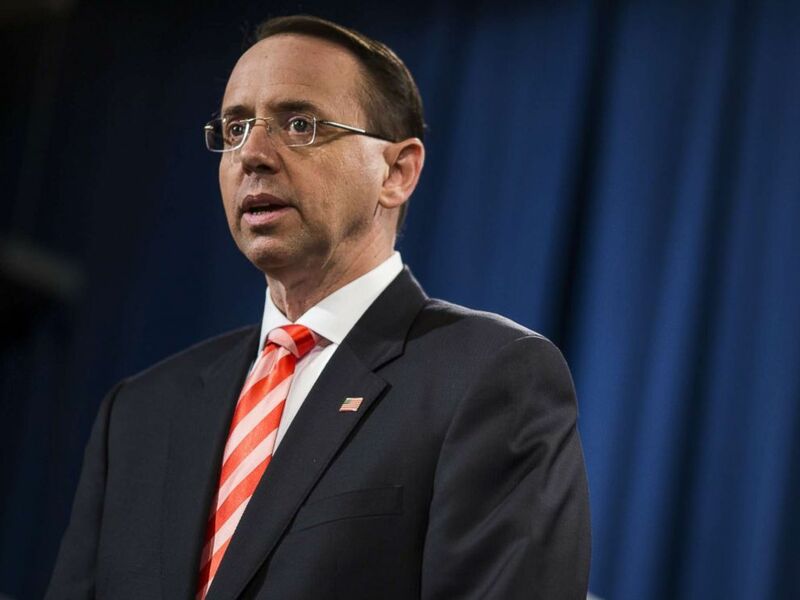 “These actions are persistent, they are pervasive, and they are meant to undermine America’s democracy on a daily basis, regardless of whether it is election time or not,” Rosenstein told the audience. In the months leading up to Rosenstein’s tension with the White House, Republicans and Democrats called for legislation to protect the investigation led by Mueller. Many Republicans — including those close to the president — publicly warned against firing Mueller or Rosenstein. "It would be a mistake and there would be consequences that the president would come to regret," said Sen. John Cornyn, R-Texas, who dined with President Trump and other GOP leaders in April at the White House. That same day at a news conference, Speaker of the House Paul Ryan said that he’d received "assurances" that Trump wouldn't fire Rosenstein or Mueller. But Joe diGenova, a former federal prosecutor who was in discussions to join Trump’s legal team, said earlier in the week that he supported the decision. 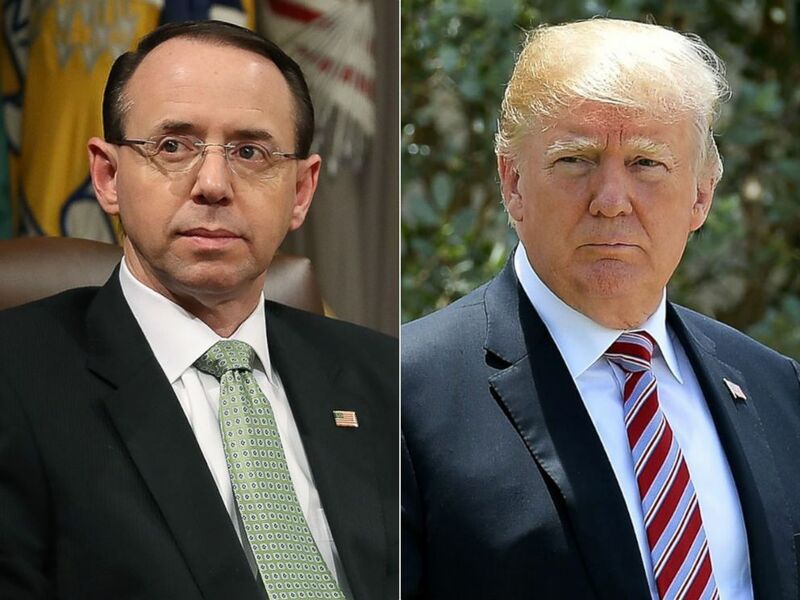 "I would fire Rosenstein in a New York minute; without any question," diGenova told ABC News’ Jonathan Karl and Rick Klein on the “Powerhouse Politics” podcast earlier this year. Rod Rosenstein, deputy attorney general, speaks during a news conference at the Department of Justice in Washington, Feb. 16, 2018. “Rod Rosenstein is so incompetent, compromised and conflicted that he can no longer serve as the deputy attorney general,” DiGenova said in an appearance on Fox News’ ‘Hannity’ earlier this year. Before becoming deputy attorney general, Rosenstein was the longest-serving U.S. attorney, serving in Maryland. Rosenstein served throughout both President George W. Bush and President Barack Obama’s administration's, holding the position for 12 years. ABC News' Matt Mosk, Lucien Bruggeman and Bill Hutchinson contributed to this report.